A few weeks ago you got a close look at the inflorescence of snow-on-the-prairie. Now you’re getting a look at its sister species, snow-on-the-mountain (Euphorbia marginata). On September 2nd I’d been driving home after photographing at two other locations in northwest Austin when I spotted a few of these familiar plants and decided to stop. Once I got close, I saw that a wasp was busy working the flowers. Like some other insects I’ve seen on flowers, this one kept moving pretty quickly, so I used a high shutter speed, 1/800 of a second, to keep from ending up with a blurred image of the wasp. That’s very interesting Steve. I searched on my blog and found a variegated Euphorbia I posted about last year, from Dunedin Botanic Garden but its a lemon colour and the species is characias with a cultivar name of Tasmanian Tiger. Your plant is gorgeous and its amazing that its just growing wild! I’m not a great Euphorbia fan but I’d happily have both of these in my garden! Sure thing. I’m happy to promote our native plants. You did very well with this capture! I don’t mind saying so myself. Some of the other pictures weren’t good, but all it takes is one. The advantages of digital photography: one or two of the many we take will come out ok. Right. I couldn’t have afforded to take nearly as many pictures when I had to pay for film and developing. Some day, it’s going to stop raining and I’ll get to go searching for such wonders, too! I tend to shy away from wasps, but their details are fascinating. 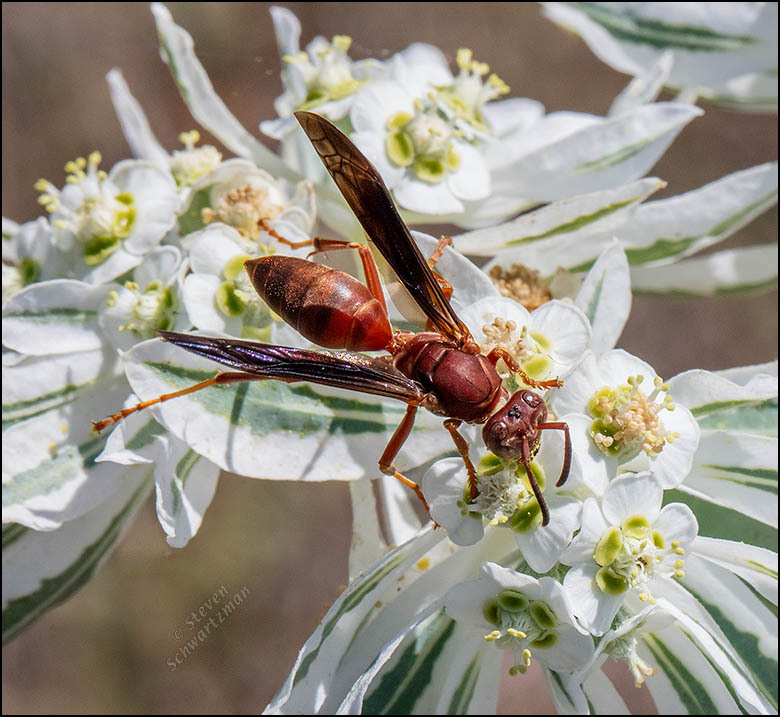 I especially like the way the background color in this photo complements the color of the wasp. How different your current wish for an end to the rain is from what people there wanted not so long ago. You may have heard me say that my attitude towards wasps and bees is that I let them go about their work and they let me go about mine. Only rarely have I felt a need to be careful around them. It’s good of you to notice the two-toned brown-and-green nature of the picture. I hadn’t stopped to analyze it. Thanks. This was one of my successful takes on the wasp. A crisp wasp, we could say. I was pleased that I could get close enough for this kind of detail. Nice work, Steve. In the heat of the sun wasps are constantly in motion and a real challenge to capture. I find the thread-waisted wasps fascinating. It’s hard to imagine anything that delicate surviving flight.The only wasps I’ve had a problem with are yellow jackets. The rest and I co-exist pretty well…outside the house. I’m not surprised that you’ve had to contend with wasps’ quick motions. It makes sense that heat correlates with their movements, though I can’t say I ever thought about it. I learned recently that bees evolved from wasps that gave up eating meat and switched to flowers. Today’s picture makes clear that at least certain kinds wasps have added the new food source without giving up the old. And like you, I don’t practice coexistence with them in the house. So . . . where is the mountain? There’s mounting evidence that the picture amounts to a lot. Insects are fascinating creatures when you get up close and personal… this is a wonderful shot. Thanks. Because my emphasis is on native plants, I often find insects and spiders on my subjects. Some critters hold still, while others move so much they’re hard to photograph. Wasps are generally in that second group, so I was pleased to get a good picture this time. Yes, I’m pleased with it. Hahha, good one. I’ve been scratching my head, trying to think whether I knew of a plant called wasp on the mountain. Finally I had a chance to read the post and was delighted to see this fine fellow. Our wasps look different. Actually we have many kinds of wasps here, some of which look quite different from this kind. Oh yes, I can see that. The native one is often a duller red than the specimen I featured, and than the Mexican species. That seems to be the way of it with native plants. Ah, but not always. There are plenty of bright native wildflowers here as well.